Cryogenics chemist William F. Giauque was one of the first scientists to research extreme low-temperature phenomena, and won the Nobel Prize for Chemistry in 1949. After high school he worked for two years for a chemical company, before deciding to pursue chemistry as a career and enrolling at the University of California at Berkeley. There he spent the next sixty-six years, uninterrupted by sabbaticals or visiting professorships elsewhere, from his arrival as a student in 1916 to the offer of a faculty position before graduation until his death as professor emeritus in 1982. 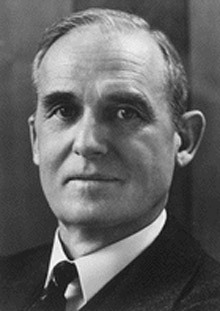 Working with Herrick L. Johnston (1898-1965) in 1929, he discovered the second and third isotopes of oxygen (mass 17 and 18). In 1926 he proposed an apparatus using adiabatic demagnetization to achieve temperatures near absolute zero, and by 1933 he had constructed a working machine and became the first scientist to achieve temperatures colder than -458° Fahrenheit (within about one and a half degrees of absolute zero). He never smoked, drank alcoholic beverages, or learned to drive an automobile.